Still Life With Compotier painting by Paul Cezanne on a rectangular Mouse Pad. This mouse pad is great for anyone with a real appreciation for Cezanne's works of art. The surface features The Still Life With Compotier painted by Paul Cezanne. The back of the mouse is made with a non slip neoprene rubber backing. This product makes for a great gift for any holiday or any time of the year. 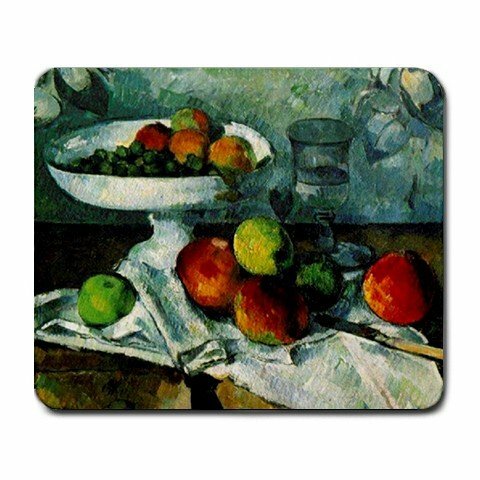 Show your knowledge and appreciation for one of Cezanne's works of art with this Still Life With Compotier Painting on your Mouse Pad. Not only will it show your understanding for Cezanne, but it will also add personality and charm to any workstation or home office.